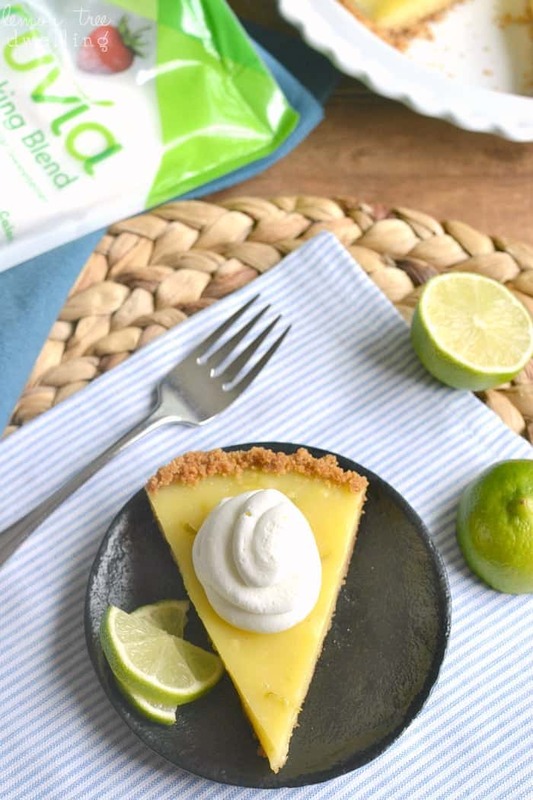 Skinny Key Lime Pie with Coconut Whipped Cream – lightened up with Truvia® and perfect for summer! Well, here we are. Father’s Day weekend! Are you ready?? I’m happy to report that I’m all set. With a present, a plan, and a semi-clean house…..which always makes a difference in my enjoyment of the weekend. I’m feeling pretty proud of myself. Not to mention the fact that I know exactly what I’ll be making for dessert….! I went back and forth on the perfect Father’s Day treat. To be honest, Jorden is not the biggest sweets guy. 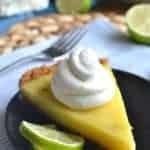 But key lime pie? That’s a different story. 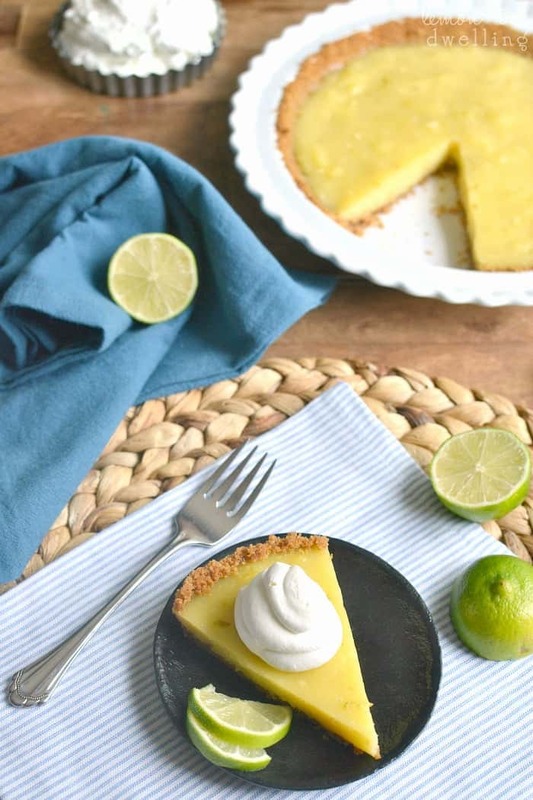 Because, to us, key lime pie is more than just a dessert. It’s what we ate on our honeymoon. And when I say ate, I mean ATE. We ate so much key lime pie, we were almost sick of it by the time we left Florida. Almost. And ever since then, it has felt like such a special treat! One that brings us back to a different time in our lives. So I guess it’s kinda funny that I plan to make it for Jorden for Father’s Day….seeing as how all the memories surrounding it are pre-fatherhood! But that’s okay, because we all know that even on Father’s Day, there will be at least a moment or two when all he wants is to be transported back to that time before kids. And this pie will do that. Another thing this pie will do? Make you feel totally fine about eating it! Because it’s lightened up from top to bottom with Truvia® Baking Blend! From the graham cracker crust to the pie, itself, to the coconut whipped cream on top…..it’s all made with Truvia®! Which means it has 75 percent less sugar than it otherwise would. And ALL the delicious flavor. I hope you have a fabulous Father’s Day weekend…..filled with pie! Prepare crust by combining graham cracker crumbs, melted butter, and Truvia Baking Blend until well-blended. Press into greased 9-inch pie pan. Bake at 350 degrees for 10 minutes. Set aside. In a medium saucepan, combine 3/4 c. Truvia Baking Blend, flour, cornstarch and a dash of salt. Gradually stir in 1 1/2 c. water. Cook, stirring constantly, over medium-high heat until thickened and bubbly. Reduce heat; cook and stir 2 minutes more. In a small bowl, beat egg yolks slightly. Gradually stir 1 c. of hot filling into egg yolks. Pour egg yolk mixture back into saucepan with remaining filling. Bring to a gentle boil; cook and stir 2 minutes more. 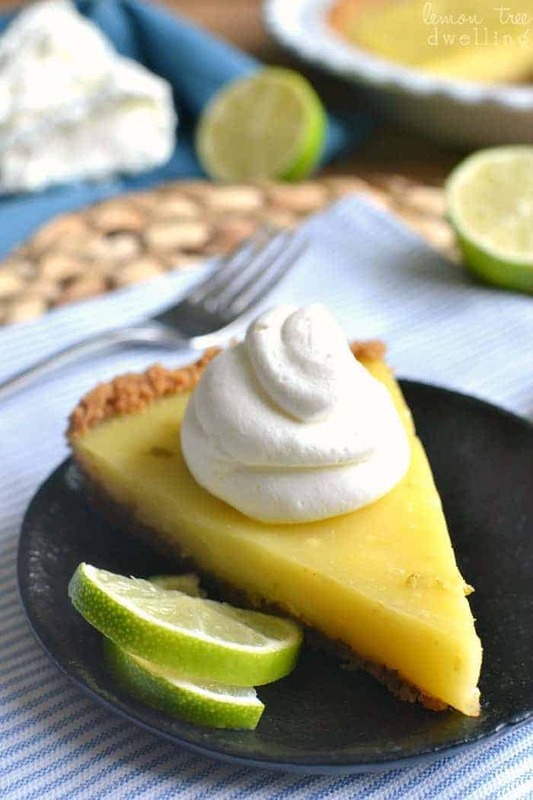 Stir in butter and lime peel, then stir in key lime juice. Pour warm filling into baked crust. Cool on wire rack 1 hour, then chill at least 3 hours before serving. Combine heavy whipping cream, 1 Tbsp. Truvia, and coconut extract in a large chilled mixing bowl. Using chilled beaters, beat at medium speed until stiff peaks form. Spoon whipped cream into a Ziploc bag, snip corner, and pipe onto pie slices. Oh you used my favorite Truvia product – YESSS! 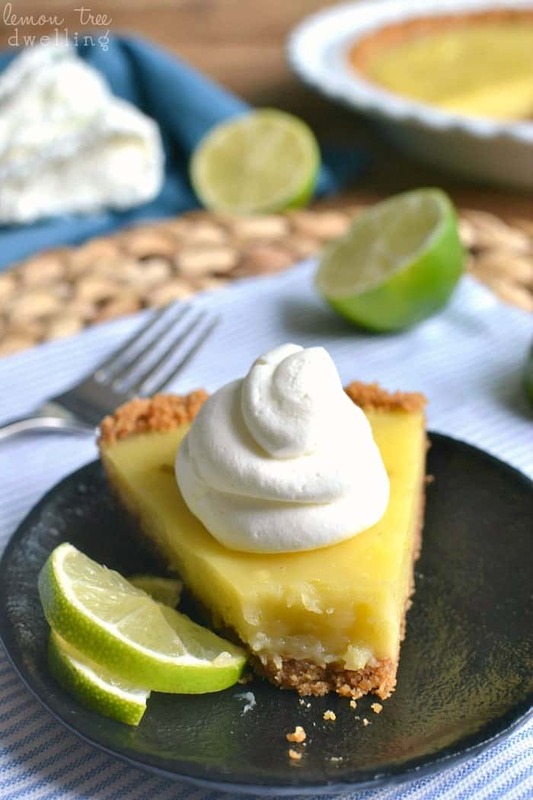 This pie looks outrageously good and totally not skinny – which is SUCH a good thing 🙂 Pinning! Ahhhh thanks, Trish! My favorite too! Hope you guys have a fun Father’s Day weekend! Looks fantastic! Thanks for sharing – I will be making this at some point this Summer :)!!!! Hope your Father’s Day was great, Cathy! This pie looks like the ultimate treat to serve for dessert. My dad would’ve loved this! Pinned! Thanks, Gayle…..we had such a nice weekend-long celebration. I hope yours was great, too! Oh this looks so delicious! need to give it a try asap! 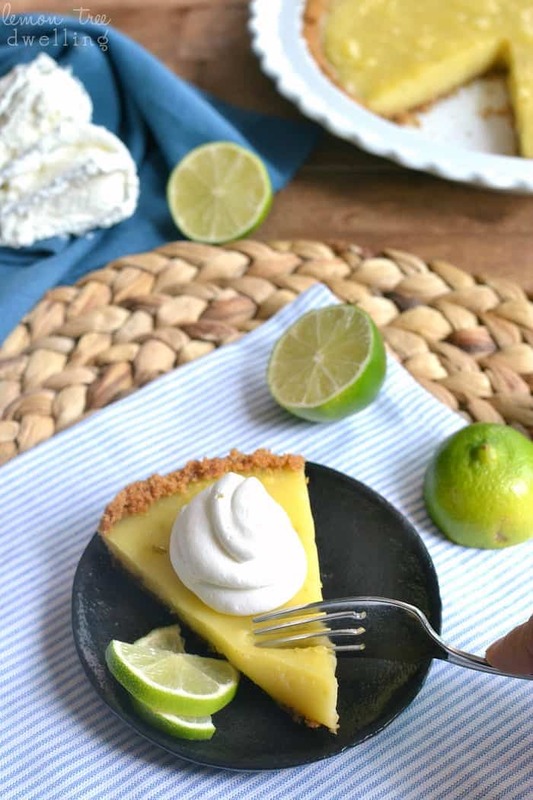 The only thing better than key lime pie is skinny key lime pie! I have to pin this! This pie is everything i want in a pie! Fresh, tart and with a delicious crust! love that you lightened it up with Truiva…my kinda dessert! Thanks so much, Meg! 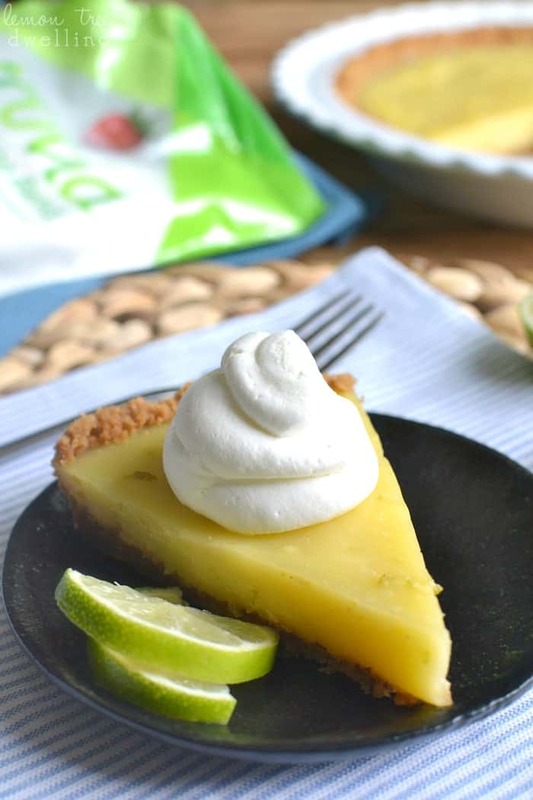 I always love key lime pie, and the Truvia made me feel that much better about indulging! I love lightened up desserts! That means I can have two pieces! 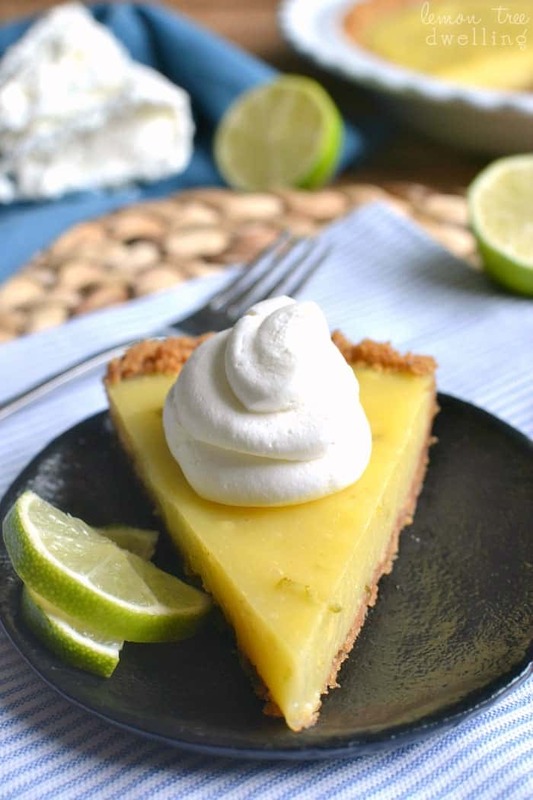 Key lime is my signature pie — I have to make it for everyone all the time! I love how you lightened this up, Cathy — it looks so tangy and delicious! This looks really good! I really enjoy skinny desserts! this looks so freaking good!!!!!! cant wait to try it and let my family taste it. I think you mean to say, “stir in lime juice” not ‘lemon juice’, right? In either case, thanks for the excellent recipe that I can actually have, without too much guilt, on my diet. Yes, I meant lime juice. Thanks for calling that to my attention! Can I use regular sugar if I don’t want to use Truvia? How much would I need? Thanks!